NEW! Wooden Shape Sorting Clock. Time to play! A colorful wooden clock features 12 shaped, numbered wooden blocks that fit into matching slots, plus movable hands! 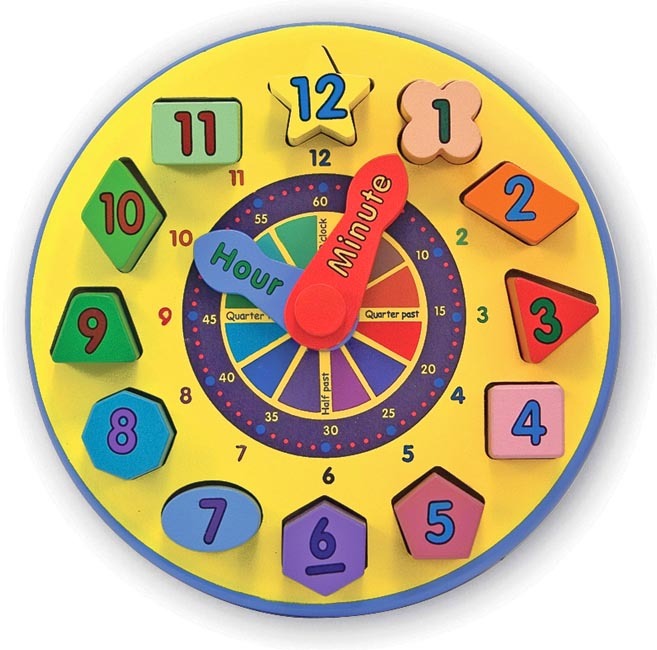 With lots of "timely" information on the hands and clock face, this is the perfect toy to help children master the abstract concept of telling time. It's great for developing fine motor skills, too! Remove all pieces from the clock. Ask the child to line the pieces up in numerical order. Ask the child to name each piece and place it in the clock. Explain the concepts of morning, afternoon, and evening, as well as A.M. and P.M. Adjust the hands of the clock to different hours of the day. Ask the child to identify an activity he/she might be doing at these times. Repeat the activity using half-hour increments. Place four or more pieces in front of the child. Let him/her study the pieces before asking your child to close his/her eyes while you remove one piece. Ask the child to identify which piece was removed. Dimensions: 9" Diameter x 2.75"H Assembled. Recommended Ages: 3+ years.